Posted on Wed, Jan 25, 2012 : 12:13 p.m.
Patricia Warner, executive director of the University of Michigan's C.S. Mott Children's Hospital and Von Voigtlander Women's Hospital, shows off the hospitals' new $754 million facility in November. She is retiring in April. One of the top executives who led the University of Michigan Health System's transition to a new $754 million facility for the C.S. Mott Children’s Hospital and Von Voigtlander Women’s Hospital is retiring. 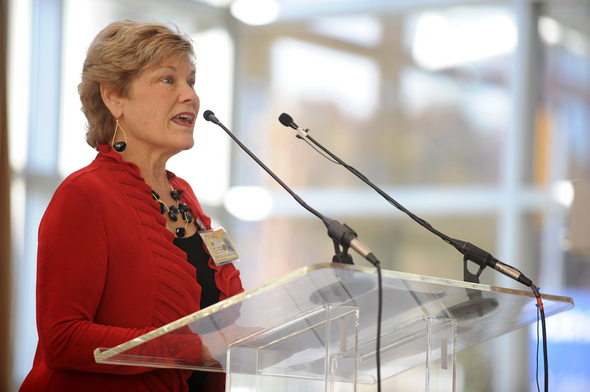 Patricia Warner, executive director of the hospitals, plans to retire April 4 on her 67th birthday, UMHS announced today. The university plans to conduct a national search to replace Warner, who graduated from the School of Public Health in 1977. Warner, who held various roles at the university's hospitals during her 35 years of service, became associate director of the children's and women's hospitals in 1994. She was named executive director in 2009. Warner played a key role in the planning for the hospitals' new 1.1 million-square-foot facility in the heart of U-M's medical campus. The new facility opened Dec. 4 after five years of construction. "This is the dream you thought would never come," Warner told AnnArbor.com on the day of the transition, a massive logistical feat that involved more than 160 patients and 3,000 employees. "This is just a huge milestone. We are one of the largest children's hospitals in the state of Michigan. The fact that all of our services will now have space to grow, to do all of their high-technology services, but most importantly to see all our patients and families in their single rooms is just an incredible opportunity and privilege." Doug Strong, CEO of U-M Hospitals and Health Centers, said in a statement that Warner led the "hospitals to prominence as national leaders in care." Thu, Jan 26, 2012 : 11:51 a.m.
Thu, Jan 26, 2012 : 2:14 p.m. Thanks for catching that duplication. Fixed it. Thu, Jan 26, 2012 : 1:47 p.m.
Haha, I think that April 4th really is her 67th birthday. I hope I look that good on my 67th birthday, and I also hope I can retire. On my 67th birthday, that is. Even though it's not April 4th. Wed, Jan 25, 2012 : 6:12 p.m.
God bless you, Pat Warner. Thank you for caring so deeply for the Mott children and families! Enjoy retirement because you deserve it and we will forever be grateful.